All Saints is one of my very, very favorite liturgical celebrations. It is a ritual that was introduced to me in the liturgical laboratory of my seminary. Sitting in James Memorial Chapel, I experienced for the very first time what it means to call upon such a great cloud of witnesses. Tears rolled down my cheeks each and every time in this holy celebration when we were invited this mystical union. Because there just isn’t another time or place in the Christian calendar that we make a space for grief. We reserve that sweet communion for funerals and memorial services but neglect to include it in the rest of our preaching and proclamation. It is the day I want to sit in the back of the church. I want to light candles and sing and quietly mourn for the loss of such amazing saints of God like my mother and my grandmother. I want to sit in awe and wonder that there is something that connects us — all of us — to the divine and to each other. No one is left out. We all share in this great heritage. But, I am called to to the front of the sanctuary. I’m called to lead the prayers. It’s my task to stand in the pulpit and share the good news. Except that grief doesn’t feel like good news. So more often than not, when All Saints Day rolls around, I spend hours upon hours preparing liturgies that allow for that sacred space. I do not preach but I find readings and poetry that will say what I can’t find the words to say to intermingle with chanted prayers from Iona and Taize. But, not this year. This year I’m serving a small little country church in Pennsylvania. I am the interim pastor in this church that believes this might just be a title to begin many years of ministry. They’ve had pastors that have stayed and an interim music director who had been there for forty years. Theirs is a church that claims tradition as if it is just one thing. Their worship reflects this so that I didn’t feel I could play too much. I had written no more than a call to worship as I tried as hard as I could to stick with what is familiar for this congregation. Still, I was restless and uncomfortable. I was restless and uncomfortable until we came to the table. I stepped before that holy ground and invited the congregation to take a deep breath before we shared in reciting the Statement of Faith. We took a deep breath because these are bold words. These are important words and we need to recognize how much power these words hold. But, more than that, I need to catch my breath. I had just preached a hard sermon and I could see the tears rolling down each face. I could feel them about to come from my own eyes. I needed to catch my breath before sharing in this proclamation of who we are as God’s saints. And then, before the invitation, I did something I wasn’t planning on doing. I invited the congregation to call out the names of those saints — alive or dead — that we wanted to invite to the table. I invited everyone to call out the names of those that they would like to dine with us. My own mind raced with people who know more about faith than I do and the people I miss so very much. I thought of famous people and the many, many people who don’t have a seminary degree but have taught me more about faith than my seminary professors because it would be so amazing to have all of those people in one place seated at one table. That was the image in my head as names were being called out from the congregation. For all of the liturgy that I have so carefully planned, there was this work of people that came with a simple invitation. Call out the names of those you wish to be here and the names kept coming — name after name after name. All of the saints were gathered in that sanctuary. All of them were there. We felt the warmth in the room as we broke bread together. We felt so much warmth. Just two weeks ago, I ventured to Cape Cod to officiate the wedding of one of my college friends. And you know what? Weddings are fun. I say this as someone who is super busy planning her own wedding and has a bit of grief about it. So, it’s a little bit of a reminder. Weddings are fun. No, really Elsa, weddings are fun. But, I wasn’t the bride this time. I was the officiant. I was the one who got to say all of the things which I used to hate. In the beginning of my ministry, I would have much preferred a funeral. I still love funerals. Funerals are at the heart of my call story. They allow me to exorcise all of my demons. They allow a space for tremendous healing in the midst of the heavy load of grief. But, I’m really starting to love weddings. A few months ago, I got to officiate my little cousin’s wedding. (The picture you see here is actually from that wedding.) And then there was this one of my dear friend. And it’s just so good. I love it. So, I guess you could say that I’m available for weddings. Go ahead and contact me. But, really, I don’t want weddings to be my main gig. So maybe don’t contact me. Lately, I’ve been devoting a lot of my time to writing. On September 1, the United Church of Christ launched a new blog called New Sacred. It’s only been a couple of weeks — but whew! The writing is awesome and I am one of the writers. My first post just appeared today in honor of the Pope’s visit. Oh, have you heard that the Pope in in town? I wrote about what went down in my neighboring city of Philadelphia. You can find it here. While you’re there, be sure to check out all of the other amazing posts. Hats off to Marchae Grair on this awesome project. As much as I am writing, I am reading. I’m reading too many books at once actually. It’s a small problem as I can’t seem to finish a single one of these books. Nevertheless, there are some really important books I’m reading right now with a group of people in something dubbed White Young Clergy Reading Racism. It started as a blog series that flopped and became a Facebook group. If you’re interested in joining our discussion, join the Facebook group here. The conversation will be better with you — and it’s the perfect time as we are just now wrapping up our conversation on But I Don’t See You as Asian: Curating Conversations About Race . It’s time to choose another book — and we’d love your ideas. 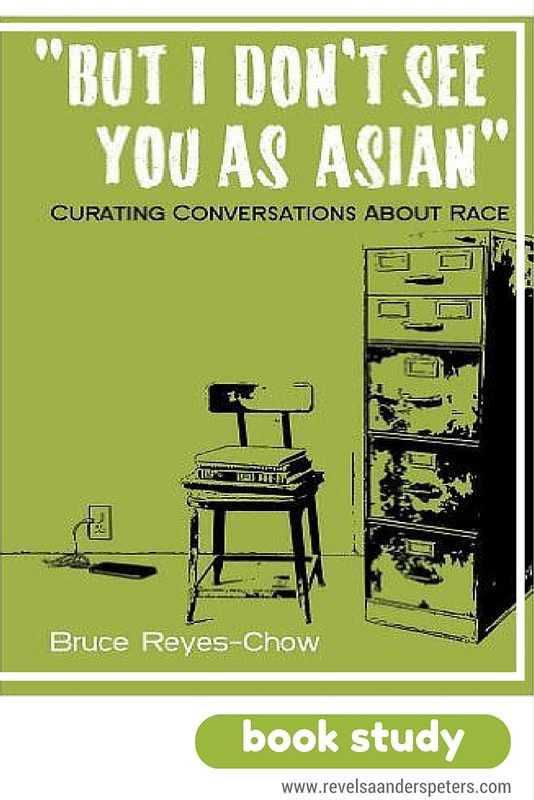 Alterna tively, if you are really, really, really sad that you missed the first conversation of But I Don’t See You as Asian: Curating Conversations About Race , head on over to my Ideas + Resources page where you can download your very own copy of this book study. Even if you’re not that sad. Maybe just because you want to confront your own racism. That’s an even better reason. So, that’s it. That’s a few good things from me. How about you?